2 Years In Relationship, Liu Yifei and Song Seung-hun Broke Up! What Happened? Korean actor Song Seung-hun has been dating Chinese actress Liu Yifei for 2 years, but recently, their break up news popped out of nowhere! Are you curious as to what happened to their relationship? Before we find out about the cause of their break up, let’s see the two artists’ profiles! Song Seung-hun is a Korean actor who was born on October 5, 1976. Before becoming an actor, he started his career by being a model for the jeans brand STORM. He first became known to the public because of his appearance in the sitcom Three Guys, Three Girls which was aired in 1996. The following year, he made his debut as an actor. His debut movie was Calla where he acted alongside Kim Hee-sun. His popularity rose rapidly in 2000 when he appeared in the widely popular TV drama Autumn in My Heart. After building the foundation of his career with this drama, he continued to actively work in the acting field by appearing in many dramas and movies such as Make It Big (2002), So Close (2002), and Summer Scent (2003). But, in late 2004, he got caught up in a scandal where he illegally avoided his compulsory military service by submitting a tainted urine sample so that it seemed like he was suffering from a certain illness. Before his scandal got bigger, he agreed to serve his two-year term in the military. After being discharged from the military in 2006, he made his comeback in 2008 by starring in MBC’s drama East of Eden. Because of his acting in the drama, he received a Grand Prize at MBC Drama Awards. In the same year, he also appeared in the action movie Fate. Later in 2009, he founded his own management agency called Storm S Entertainment, which was later changed to Better ENT. Until now, he is still active. We can see him in MBC’s variety show I Live Alone. Recently, we were able to see him in OCN’s drama The Player alongside f(x)’s Krystal. If you want to know his current activities, you can visit his Instagram account @songseungheon1005! If you are a fan of Disney, you must have heard the name of this actress because Liu Yifei received the role of the famous, brave Disney princess Mulan in the movie Mulan that will be released in 2020. Liu Yifei was born on August 25, 1987, in China with An Feng as her birth name. But, due to her parents’ divorce when she was still 10 years old, she later adopted her mother’s family name and changed her name to Liu Ximeizi. At the same time, she also started to model while training in singing, dancing, and playing the piano. At the same age, she and her mother moved to New York. In 2002, she went back to China in order to pursue her acting career. She also used her stage name Liu Yifei while being active in the field. Only a few weeks after she returned to China, she was accepted into the Performance Institute of Beijing Film Academy at the age of 15 and later graduated in 2006. Not long after she was accepted into Beijing Film Academy, she also received many offers to appear in television series. She made her debut by appearing in the period romance drama The Story of a Noble Family which was based on a novel with the same name. In the same year, she got to act as Wang Yuyan in another novel adaptation titled Demi-Gods and Semi-Devils. Due to her role as Wang Yuyan, she received the nickname Fairy Sister from the media and her fans for her sweet and delicate image. After her career built up in China, she started to go international in 2014 and collaborated with actor-singer Rain in For Love or Money. The next year, she starred in another Chinese-South Korean production The Third Way of Love where she met Song Seung-hun. After succeeding with many works internationally, she was cast as Mulan for the live-action adaptation of the 1998 Disney animated film. The movie is set to be released in 2020, so it looks like we still have to wait a few years until we can see her performance! Are you excited? If you are curious about her latest activity, you can visit her social media account on Instagram or Weibo! 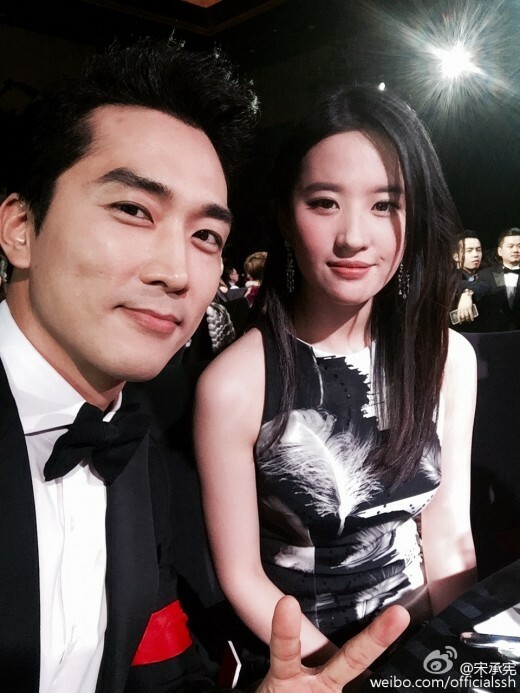 Song Seung-hun and Liu Yifei started dating in 2015. They first met when they worked together for the Chinese-South Korean production The Third Way of Love in 2013. Song Seung-hun’s agency confirmed that the two were dating and also said that the two actors became close on the filming set. After they became closer, they went one step further and started dating. There was even a rumor that said they had introduced themselves to each other’s parents and had planned their wedding, but Song Seung-hun’s agency denied this. But, in January 2018, the news about their break up surfaced. Song Seung-hun’s agency confirmed this and made an announcement about their break up. The agency said that they had broken up naturally due to their busy schedules. They also made sure that they broke up because of the Terminal High Altitude Area Defense (THAAD) issues between South Korea and China. Actually, even before the official announcement came out, there were many rumors about their break up from previous years. Even though the agency denied the rumors, this time, it was true and did not surprise some netizens. Now that the two’s relationship has ended, what do you think about Song Seung-hun and Liu Yifei’s break up? Do you think that it’s a shame that they broke up after 2 years of being in a relationship? Don’t forget to leave your thoughts in the comment section!